We were having the funeral for the 2008 Red Sox. Heck, I even gave one of the eulogies. Called my dad during the seventh inning for the requisite, “Yup, we just didn’t have it this year,” conversation and everything. My father and I covered all the bases in that phone call. The Sox were too banged up. They missed Manny. They didn’t have enough reliable relievers. They had too many young guys with Schiraldian looks on their faces, too many pseudo-fans in the stands, too few free spirits in the dugout. They never should have let Josh Beckett pitch to those last two batters in Game 2. They never should have put Mike Timlin on the playoff roster, much less brought him in for the 11th inning of Game 2. And now, they were going down with a whimper. They were going to get swept in the middle three games at home, three humiliating losses to their formerly scrawny stepbrother in the AL East. Our boys seemed fine with it, and that was what really troubled us. Who was this team? Where were the guys I watched for 6½ months? Were the defending champs really handing over their title without a fight? I remember uttering the words, “I wanted us to win tonight if only because it would have been another two days where I didn’t have to think about Matt Cassel.” I remember Dad admitting, “I turned it off 20 minutes ago; I’m watching ‘ER. '” I couldn’t even blame him. We hung up. I didn’t turn off Game 5. I did the old “half-watching it, going through e-mails and not getting totally invested even though I totally was” thing. When Tampa Bay’s Grant Balfour allowed two baserunners in the bottom of the seventh, I would have been more excited with Dustin Pedroia coming up and David ORRR-tese (as Buck Martinez keeps calling him for reasons that remain unclear) on deck if Big Papi hadn’t passed away about three weeks ago. During an earlier inning, one of my Red Sox e-mail buddies wrote after yet another Papi whiff, “I’d rather have Brandon Moss or Jeff Bailey or Matt Stairs batting third for us. Papi is not just useless, he’s visibly, obviously, pathetically useless.” I love Papi and couldn’t even muster a counter-argument. You can’t hit for power with a bum wrist. You just can’t. Meanwhile, Pedroia was battling Balfour. And something weird was happening. With no reason at all to believe, the Fenway fans were standing and cheering and willing Little Man to get a hit. This was an unexpected old-school Fenway crowd, like the ones we had before they turned Fenway into a theme park and it became acceptable for everyone to joyously sing the “So good! So good! So good!” part of “Sweet Caroline” in the eighth even if the Sox were trailing by eight runs at the time. By Game 5, with the season stumbling to an end and the demand for tickets waning, the Rich People Who Go To Games Just To Tell People They Went weren’t so interested in going, and suddenly, Fenway was Fenway again. And that was exactly what they tried to do. which, of course, ended up coming in handy three times. I watched Wheeler pitch many an eighth or ninth inning, suffered through his occasional failures, enjoyed his successes and never trusted him for a damn second. There are two kinds of closers: the lights-out guys (like Papelbon), and the hold-onto-your-seats guys (like Wheeler). When you need three improbable runs, you want the second guy out there. He’s the guy who might get nervous. He’s the guy who thinks to himself, “Deep down, I know I’m just a very good set-up guy masquerading as a half-decent closer.” When the great comebacks happen in baseball, they usually happen with these specific types of guys on the mound — Donnie Moore, Calvin Schiraldi, Bob Stanley, Jose Mesa, a long-in-the-tooth Robb Nen — the guys who can be broken, the guys who can absolutely be taken deep in the right spot. I didn’t care that Wheeler saved the Rays by getting 10 huge outs in Game 2. This was different. This was Fenway. This was, “I’m the only person standing between the World Series and one of the great collapses in modern baseball history.” This was a spot for Mariano Rivera, not Dan Wheeler. and yet, I can’t stop thinking about the soul-wrenching tramp who married me first and broke my heart. I wish it wasn’t that way, but it’s going to take some time. The fact that Manny finished the 2008 playoffs with an OPS that was almost as high as my freshman GPA in college didn’t help.) And if Bay failed to get on base, I would have punched some things and complained about Manny again. That’s right, we had the $14 million grand slam in 2007, and now, I’m starting to think the next $14 million was a downright bargain for 2008. I might buy one of those Drew T-shirt jerseys before everything’s said and done. Don’t rule this out. Anyway, Fenway went absolutely insane. Like Games 4 and 5 of the 2004 ALCS against the Yanks all over again. Finally — finally! — we were defending the 2007 title. I quickly called my father again to make sure he wasn’t watching “The Mentalist” or something. “J.D. Drew!” he screamed. “I always liked him!” So much for Maura Tierney. That same inning, a few minutes before Mark Kotsay belted a double off B.J. Upton’s glove in center, I started thinking we could survive Game 5 even after TBS flashed one of those ominous “Don’t delude yourself, this would be the biggest comeback in playoff history” graphics. Francona mercifully pinch-hit Sean Casey for Varitek, which was slightly more dignified than just shooting him in the head. (Since May 22, Varitek is hitting something like .178. I’m not even making this up. 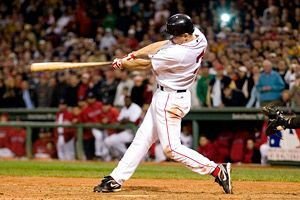 When I made my “Silver Linings for the End of the Red Sox season” list in my head in the fifth inning, “I don’t have to watch another Varitek at-bat this season” narrowly edged “I don’t have to worry about Mike Timlin pitching in a close game again” for the No. 1 spot.) I would have wagered anything on The Mayor coming through, but he struck out. Two outs. That’s when Kotsay followed with his double. and wouldn’t you know it, on the 11th roll, he came through with the game-tying single. Ladies and gentleman, the Human Craps Table, Mr. Coco Crisp! Of course, there was one problem lurking over everything: We still didn’t have anyone to pitch the ninth. Or the 10th. Or any other inning. Rookie Justin Masterson started the ninth by default under the “if they brought out Timlin or Javy Lopez, there would have been a riot” corollary. The good news: Masterson possesses semi-electric stuff with a vicious sinker that causes an uncanny number of ground balls. The bad news: He has been a reliever for only three months. Hence, he’s one of those Tightrope Guys — you never feel safe with him, but he has a knack for inducing killer double plays at the perfect time. Which was exactly what happened here: He put two guys on and briefly sent Fenway into “Oh God!” mode before suckering the Quietly Terrifying Carlos Pena into a spine-crumbling 4-6-3 to end the inning. The Rays brought in “flame-throwing” lefty J.P. Howell to start the ninth against Little Man and David ORRR-tese. (Note: I’m not sure what happened with the TBS announcing crew this series, but Ron Darling sounds like a cross between Gene Simmons and James Woods, and every time Martinez unleashes one of those smoky laughs, I think of the reader who compared him to Elmo Blatch in “Shawshank.”) If you didn’t think Big Papi was injured before this at-bat, you changed your mind when he tried to bunt for a hit with one strike. That was like watching Larry Bird pass up a wide-open 3-pointer to take a 19-footer. I don’t want to talk about it. After Papi feebly whiffed on four pitches for the second out, Kevin Youkilis slapped a grounder to Evan Longoria — a wonderful player and the only acceptable answer to the question, “Which American Leaguer would you want if you were starting a team from scratch?” — who made a terrific back-handed stab and then flubbed the throw. The ball bounced over Pena’s glove and into the stands, sending Yook to second and spawning a fantastic replay of Joe Maddon staring out onto the field like one of the Fortune 500 CEOs watching the Dow drop another 500 points. Like, he knew it was falling apart and there was nothing he could do, only there was a dugout camera 3 inches from his face. but he spent his career playing for 65-win teams in Pittsburgh and just watched Manny dominate the NL playoffs to the point that teams were pitching around him like he was the oversized kid in a Little League game. At least see whether he’s anxious, right? At least see whether he’ll chase a couple of high fastballs and a slider in the dirt. Also, why would you want to pitch to someone who just homered and was 4-for-7 against Howell in his career? Why not pitch cautiously to Bay, see whether you can get him out and, if you do, walk Drew and put the game in the hands of Jed Lowrie and Kevin Cash? Wait, why am I complaining about this? You know the rest: Drew cranked a single over Gross’ head, Youkilis pranced home, screwed up his steps and almost blew out an ACL jumping on home plate, and then everyone congregated into a Walkoff Mosh Pit as “Dirty Water” cranked from the loudspeakers and the Fenway faithful jumped up and down. The Boston Red Sox had lived to fight another day. More importantly, the champs decided they were going down swinging. Win or lose this weekend, that’s all we wanted. Show some pride. Show some heart. Show us last season meant something. And they did. Now my phone was ringing off the hook. Just like old times. My father was claiming he had watched the whole game, never knew about Maura Tierney’s last episode and stopped watched “ER” three years ago. My buddy Bug was raving about the old-school Fenway crowd and wondering whether we could create a Red Sox Fan competency test for future playoff games. The calls and e-mails kept coming. Somewhere along the line, I found myself thinking about the poor Tampa fans and their first Stomach Punch game. That was as brutal as it gets. A dagger to the gut. Normally, I would save such an e-mail and get my revenge in a mailbag or something if things happened to turn. Not this time. When the Sox roared back to send the series back to Tampa, for the average baseball fan with no vested ties, it probably was like watching South Bend charge back from 20 down to break Hickory High’s hearts. You can’t root for that and you shouldn’t. So let’s just agree a memorable baseball game happened Thursday night. It delighted a large group of people and devastated a much smaller group. Everyone else marveled at the comeback and probably thought the outcome was unfair, considering the payrolls and the histories of the respective franchises. Unbelievable, memorable, but slightly unfair. And that’s fine. I just know we’re headed for one more fascinating game and possibly two. Can the Rays rally from one of the most demoralizing defeats in baseball history? Can the Sox capitalize on their momentum like they did against the Yankees four years ago? Can I survive a few more Varitek at-bats without gargling lighter fluid? Will my father ever recover from Maura Tierney’s departure from “ER”? Will Drew earn the third year of his contract a year ahead of time? Will Josh Beckett crack 93 mph on the radar gun? Will James Shields earn the name “Big Game James”? Can the Rays possibly keep hitting after scoring 34 runs in the past four games? You have to admit, this sports weekend suddenly became much more interesting than it was 24 hours ago. 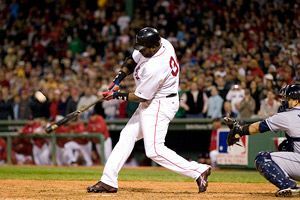 Over everything else that happened Thursday night — Balfour throwing that fastball to Ortiz, Longoria botching that throw, Drew taking Wheeler deep, Youkilis awkwardly hopping on home plate — I will remember staring at that clock and rooting for Oct. 17. They always said Red Sox fans would care a little less after we climbed the mountain once or twice, that it wouldn’t mean as much, that it couldn’t possibly mean as much. That’s not true. It will never be true. You either love sports or you don’t.